Design for the Unexpected: From Holonic Manufacturing Systems Towards a Humane Mechatronics Society presents new, even revolutionary, ideas to managing production and production systems which may fundamentally shift the paradigm of manufacturing systems design. It provides guidelines for the design of complex systems that can deal with unexpected disturbances and presents a decentralized control methodology that goes far beyond the traditional hierarchical control approach that currently prevails. 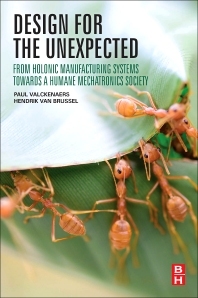 The benefits are illustrated by a variety of examples and case studies from different fields, with the book's well-established authors presenting Holonic Manufacturing Systems (HMS) as the framework for the ‘factory-of-the-future’, and suggesting that the application of biologically inspired control paradigms can control complex manufacturing systems, and that there are far wider applications for these systems than pure manufacturing. In addition, the book explores how this multi-agent control framework can be extended to other fields such as traffic, transport, services, and health care. Mechanical engineers; manufacturing engineers; system engineers; industrial engineers; MSc and PhD students; production system designers; production planners, ICT strategy and vision developers, IT professionals. Appendix I: What are (Software) Agents? Professor Valckenaers has a Master’s degree in engineering, specializing in computer science, and a PhD in mechanical engineering from KU Leuven. He has over 25 years of research experience, including participation in numerous international cooperative research projects. He has translated and applied the concept of a holonic execution system to multiple domains: manufacturing, logistics, networked production, fleet robotics, traffic and transportation, smart grids, integrated healthcare. Professor Van Brussel is world-renowned for his research on robotics, mechatronics and holonic manufacturing systems. During his career of 40+ years, he has been active in the intersection zone between several disciplines: mechanical engineering, electronics and control engineering, information technology; a domain which is now called "mechatronics". He has held numerous positions and won many notable awards and honors during his career. I am a masters candidate at the University of Stellenbosch and have been referencing this book in many aspects of my research not only for the ARTI reference architecture but for the good design principles it proposes. Any engineer would benefit from reading this book.